Built in 2007, my Warmoth HSH Strat was really just an attempt to build the perfect guitar. I was pretty much fed up with mass produced instruments in that none of them offered everything I wanted. Some had the right woods, but not the scale length. Others were insanely expensive or didn’t offer all the options I wanted. Even the ones I liked I would have ended up gutting and putting in different pickups, rewiring the electronics and replacing the hardware. So it seemed the most sensible choice was to build my own using Warmoth parts. Since my goal with building a guitar was to create the best of all possible worlds in one instrument, for my style and sound. I like the feel of strats, but wanted something with more power like a Les Paul. I really liked Super-Strats like my Ibanez Jem, but didn’t want a Floyd Rose or something purely for high gain. I wanted a guitar that had life. So instead of a typical Alder or Ash body I went instead with a one piece mahogany body with a maple top (The classic Les Paul combination). The neck was straight ahead maple/ebony with 22 stainless steel jumbo frets. Instead of a floyd rose I went with a Wilkinson trem. The pickups are all Seymour Duncan and I incorporated a switching system that allows 31 unique pickup combinations. In 2011 I decided to make a major change by replacing the neck. The guitar had always been hands down the best guitar I’d ever played but it still never felt perfect. I think no matter how you learn about building or playing, you never really know what something will play or feel like till you have it in your hands. I decided I wanted to have a thinner neck with smaller frets. Everyone always raves about JUMBO frets, as if bigger equals better, but the fact is I like to play on guitars where I can feel the wood. Those jumbo’s were cool, but I felt like I was up in the air. I also changed the width of the neck from a 1 11/16 to 1 5/8. Again, bigger always isn’t better. I liked the smaller width like Fender Strats. Of course the most stark and obvious change is the neck woods. I originally choose the neck woods probably more for looks than anything else. All my other guitars were maple and I liked the tone, so might as well go the same way right? Well I decided that I wanted to go in a complete opposite direction, damn the looks. I decided on Goncalo Alves neck with a Pau Ferro fretboard. Instead of the bright maple tones, I really wanted this thing to have a dark sound to it. Not to mention, the raw wood. So far it's been simply an amazing change. I loved how the guitar sounded before, but now it's as close to perfect as I had dreamed when I first had the idea of building it. It will definitely get some major use on my future albums. This guitar is equipped with one of the most versatile switching systems available. Both the neck and bridge humbucker are individually wired with 3 way (on/on/on) switches that enable each humbucker to be set in either Series, Parallel or Single Coil mode. There is also a "always on" (on/on) switch for the bridge humbucker that allows for the bridge pickup to be engaged at any moment. 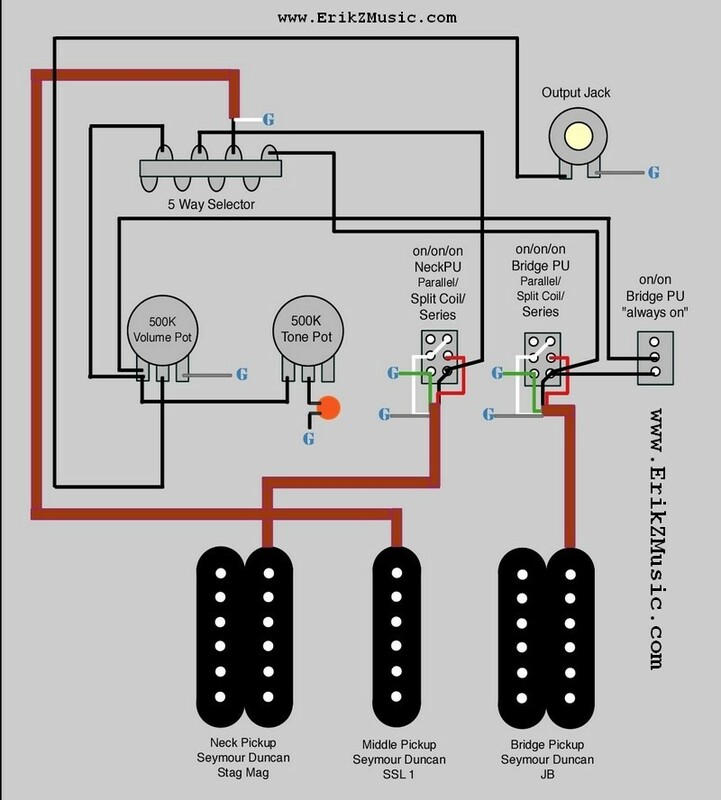 These three switches, along with the normal strat 5 way, give this guitar 31 unique pickup combinations.